I've never been a huge dress person, I have a pear shaped figure & I always have a really hard time finding dresses that I like & that look good on me. The past few months I have stepped out of my comfort zone when it comes to my fashion pieces & I couldn't be happier! Shabby Apple is a clothing company I've followed for quite some time, I'm head over heals for some many of their beautiful pieces! At Shabby Apple you will find dresses, tops, skirts, jackets, even wedding styles, their clothing features an artful design with a vintage flair! A few weeks ago we were planning our Easter outfits, I chose to go with a Navy theme this year & I'm so glad I did! 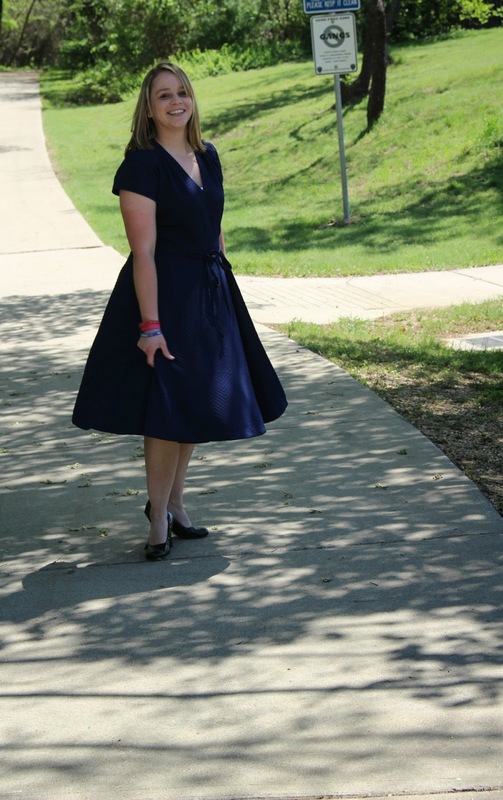 I chose to wear the French Quarter Dress Textured Navy from Shabby Apple, while my daughter wore a dress from Carters & my son wore a polo from Osh Kosh B'Gosh. Easter 2015 with my lovely children! The French Quarter Dress is a dress I would of never thought about trying on at the store, I've never owned one like it, but I'm so glad I chose it! I can't get over how beautiful this dress is, the wrap dress features cap sleeves, it's super soft & is the perfect knee length! It would be great to wear year around, pair it with heels for spring time & then boots & leggings for cooler weather in the fall! So what do you think? Would you wear it? What are some of your favorite clothing pieces from Shabby Apple? Feel free to stay connected with Shabby Apple on Facebook, Twitter & Pinterest! Absolutely stunning! I love that color blue on you!! Such pretty family pictures, and your dress is fabulous! Never heard of Shabby Apple, but I love there dresses, especially the day in the park dress in the green color.